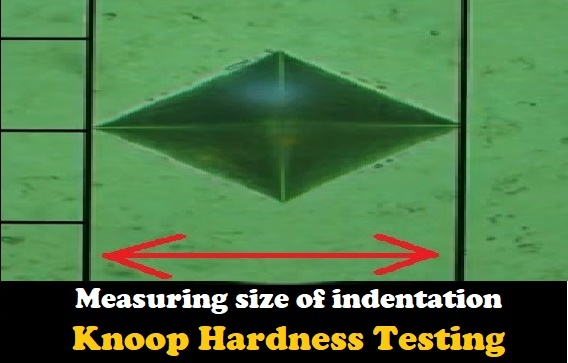 The Knoop hardness test method is also known as a microhardness test method and is somewhat alternative to the Vickers method of testing. It can even replace a Vickers test in some situations. It is an optical method in which the size of the indentation left by the indenter is measured. In Knoop hardness testing machine the hardness of the material is calculated by using a diamond tool. First, the sample is prepared for the test and kept under the tooltip. With proper settings, the diamond tip is pressed onto the sample surface. This produces an indentation on the surface of the sample in the shape of a pyramid. The depth of the impression will be approximately 0.01 to 0.1 mm when applied 1 Kgf force (or less than that). The impression is then observed using a calibrated micrometer as shown in the above image. The lines are set to the impression endpoints and height and width is calculated. Now, after finding the area of impression Knoop Hardness(HK) is calculated using formula.